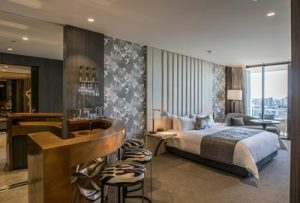 Emporium Hotel South Bank, Brisbane’s newest boutique luxury hotel, has unveiled a limited range of stunning premier suites, now available for booking. Starting from $850 per night, they include two Exquisite Suites, two Emporium Suites and three Poolside Cabana Suites. Located on the highest levels of the hotel, the spacious premier suites boast opulent and contemporary finishes, high ceilings, a spectacular handmade bronze bar with seating for three people, a full-bottle Eurocave wine fridge, mini-bar, 55inch mirror finish LED television, Bose Soundbar, king-size bed, spacious walk-in wardrobe/dressing area, and private balcony with seating to take in the magnificent views of Brisbane’s river and city skyline. Generous, immaculately finished ensuites feature a free-standing bath with a city/river outlook, double marble shower with both handheld and rain shower heads, white marble double vanity and separate toilet compartment. The Exquisite Suites are a generous 50sqm in size with 2.5-metre high ceilings, large makeup vanity with oversized LED lit mirror, plus a unique storage space tall enough to hang a wedding dress or formal gown, while the Emporium Suites are a larger 70sqm with ceilings reaching 2.7 metres and walk-in robe. Both suites feature a 32inch mirror television in the ensuite, which can be enjoyed while soaking in the free-standing bath with river/city views. The truly unique, resort-style Poolside Cabana Suites are located beside the hotel’s spectacular 23m infinity edge rooftop pool on the 21st floor and are designed to allow guests to relish in the famous Queensland sunshine and weather. Each boasts direct access to the pool deck along with a front patio and seating to relax and enjoy the incredible, panoramic city and river views.